He doesn't tend to do things by half, Ben Kraus. Not only does he like to brew collaborative beers with international stars, where he might engage in things such as brewing wet hop beers in the dead of night, sending beers in wine and whisky barrels by sea across the planet or adding wild yeasts from wineries to beers, but he's happy to take beers in all directions and into anywhere that will have him. 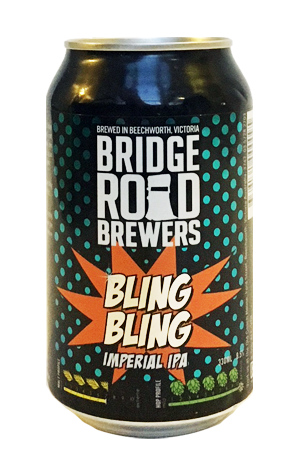 As such, when the Bling Bling Imperial IPA – a bigger brother to his long-standing Bling IPA – he headed to the 55th floor of Melbourne's Rialto Tower to the Lui Bar of the three-chefs-hats Vue du monde. There, gazing out across the city and Port Phillip Bay, his invited guests were the first to taste the 8.5 per cent hoppy treat. And treat it is too. While there is a solid malt backbone in place to bear the weight of the heavy hopping regime, it doesn't over-impose itself, allowing the punchy hop aromas the freedom to draw you in and plenty of hop character to shine through in the taste to create a full flavoured yet nicely balanced hop bomb of a beer. The beer has since proven popular enough to become a pretty much permanent release, joined in the Bling family by the mid-strength Little Bling. And, as of winter 2018, it's available in cans too.